Annapurna range of mountain is the paradise for climbing in Nepal and trekking in Nepal. The trekking in Annapurna region is very popular however the climbing in the Annapurna I can be considered as world famous. The tenth highest mountain in the world presents you the breathtaking scenery as well as test of your endurance and perseverance. Annapurna First Mountain is tenth highest mountain in the World and which is situated in Nepal. Annapurna 8091m was first climbed by a French expedition 1950. There are four summits called Annapurna ; the entire massif forms a barrier on the northern side of the Pokhara valley. The main summit is to the west of Annapurna sanctuary. A French Expedition led by Maurice Her zong explored the Kali Gandaki valley in 1950. After descending Dhaulagiri was too difficult, the turned their attention to combing Annapurna. Hampered by inaccurate maps, they spend considerable time and effort finding a way to the food of the mountain. They eventually ascended via Miristi Khola to the north face of mount Annapurna first and made what was the first ascent of any 8000m. Peak on June 1950, just before the start of the Monsoon. The Summiteers suffered frostbite on descends wand were finally evacuated back to the road head in India. Annapurna was not climbed again until 1970, when British army expedition followed essentially the same route as Herzog. At same time Cris Boning led successful ritish expedition to the very steep and difficult south face. 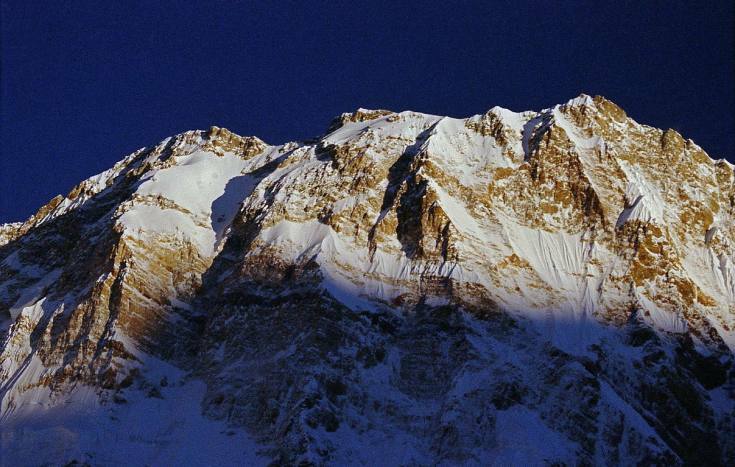 With only 109 ascents, Annapurna has had fewer successful climbs than any other 8000m peak.